Admission Price: Free to attend, please register to book your place, there are limited spaces. This free public walk explores the design legacy of Modernist architect Berthold Lubetkin, with experts on hand to explain how his iconic buildings laid the groundwork for Britain’s post-war Welfare State. 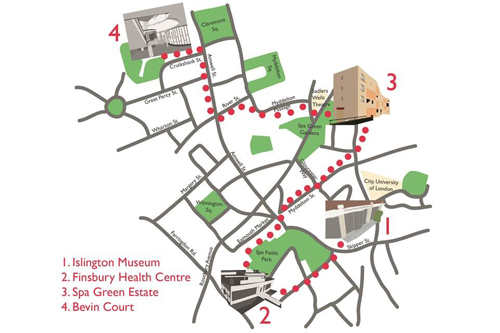 The walk will begin at the entrance of the Islington Museum. The walk, part of the Clerkenwell Design Week Fringe, will be led by David Ashford (City, University of London) and Alex Smith (Islington Museum). Lecturer at City, University of London, and the author of Autarchies (Bloomsbury, 2017), Orcs (Veer, 2015) and London Underground: a cultural geography (LUP, 2013). His research interests include Modernism, cultural geography and philosophy. He is currently working on a book on literature and architecture that engages with the work of Modernist Berthold Lubetkin.